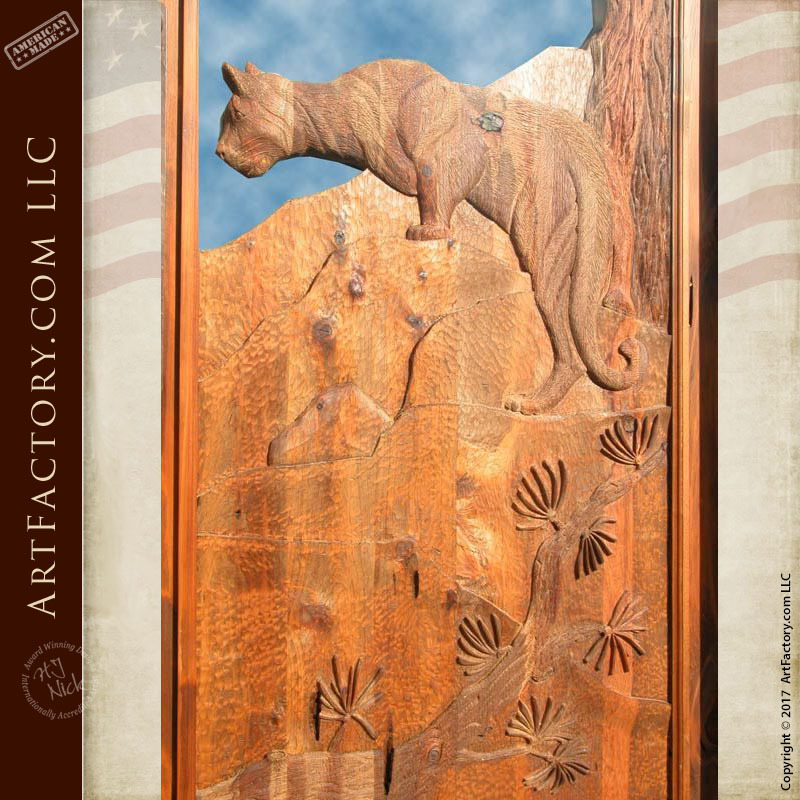 This mountain lion carved front door is a masterwork by one our master carvers. It matches 2 carvings back to back, with clear 1" thick. thermal glass as separation to allow light through. 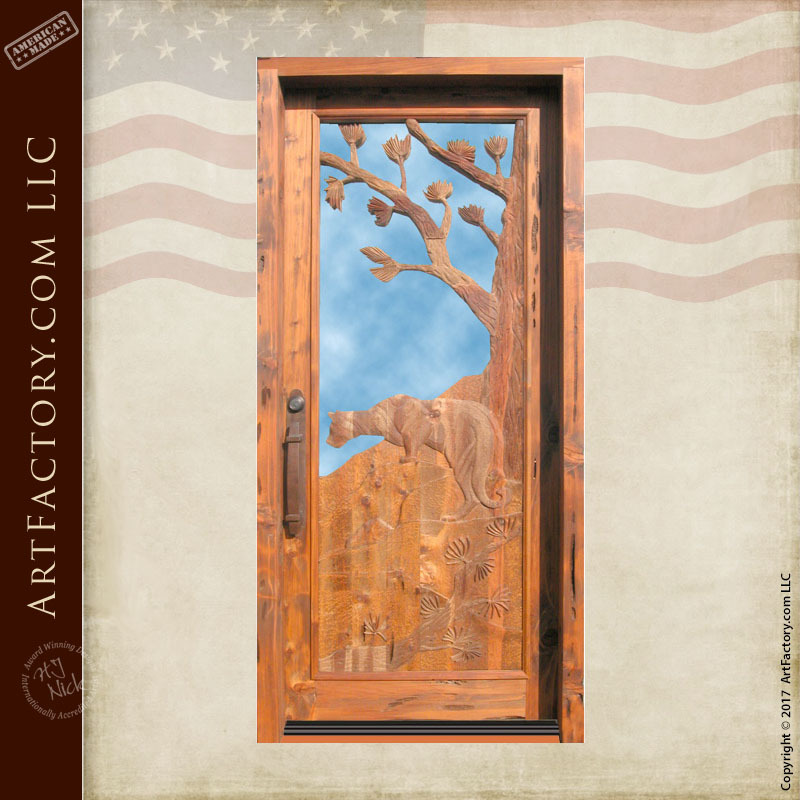 The customer furnished the artwork and the design idea for this mountain lion carved front door and had our designers personalize it for their home. All of our doors are handcrafted for you by our master woodcarvers, expert craftsmen, and classically trained blacksmiths. At ArtFactory.com we enjoy raising the bar to bring your ideas to life. There is no limit on the size, design, color, finish, or thickness of our custom wood doors. Our ability to design and build is only limited by your imagination. To top it all off, custom design work for your entrance door by one of our designers is included for no extra charge. The mountain lion is a silent cat, the only big cat that cannot roar. They sit at the top of the food chain, only occasionally competing with other predators for food. 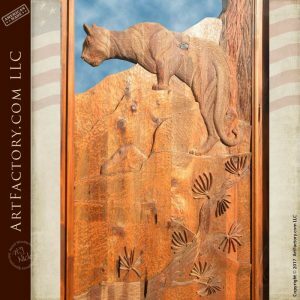 Mountain lions are solitary and cunning, a difficult thing to portray in a wood carving. Once the final design for this wood entrance door was approved by the client, it was turned over to our master woodcarvers. Their skill and eye for detail enabled them to bring this customer's vision into reality, regardless of the difficulty. This is a thick, solid wood exterior door that is hewn with mortise and tenon construction. This type of construction ensures that your custom entrance door will stand the test of time. Additionally, we build all of our doors with full length, naturally air dried timber. It has been hand carved by one of our master wood carvers to create this beautiful design. Most importantly, our doors are carved by the hands of one master, never CNC or gang carved. This allows for a carving that will be recognized as fine art in the eyes of appraisers. Finally, it is certified by renowned artist H.J. Nick to meet all world class, fine art specifications. Every product that comes out of our shop is built under the supervision of H.J. Nick, and inspected to ensure every aspect of the piece meets fine art standards before it is stamped with the H.J. Nick seal. This ensures that you will own an investment quality piece with appreciable value in antiquity. 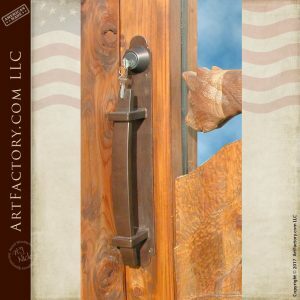 All of our doors also come with fully customizable, blacksmith hand forged, wrought iron hardware. This mountain lion carved front door as show has been fitted with our popular English lodge style door pull, that has been finished with a bronze, monochrome patina. All of our hardware products are advance patinated using our proprietary, hand applied, heat infused, iron oxide process. This process bonds the color to the metal at over 1000 degrees Fahrenheit. This process allows for a finish that will stay beautiful for generations with little or no maintenance. Order your dream entrance custom designed for your residential or commercial property today. Make a first impression that reflects your personality and accomplishments. All of our wood doors are built to exceed hurricane codes worldwide, and are virtually maintenance free. Contact us to today to discuss your designer door ideas at 1-800-292-0008 and received a custom quote. Never settle for the rest when you can have the best. Only, at ArtFactory.com.